Andrew Ramsay. Photo by The Book. 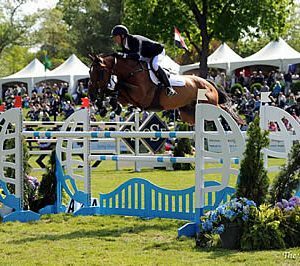 Andrew Ramsay (USA) led the victory gallop in the $130,000 Empire State Grand Prix CSI3*, presented by The Kincade Group, riding Cocq a Doodle to conclude the 2017 Old Salem Farm Spring Horse Shows on Sunday, May 21, at Old Salem Farm in North Salem, NY. 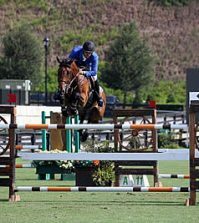 After a second-place finish in the feature grand prix during the first week of the Old Salem Farm Spring Horse Shows, Ramsay and Cocq a Doodle, owned by The Doodle Group, moved up for a victory in the $130,000 Empire State Grand Prix, presented by The Kincade Group, in a three-horse jump-off. The only double-clear effort of the day belonged to Ramsay, who stopped the clock at 45.50 seconds over a jump-off track built by 2017 Longines FEI World Cup Final course designer Alan Wade (IRL). 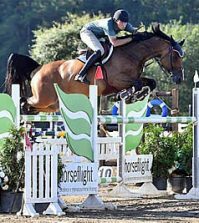 Earlier in the day on the Grand Prix Field, Madison Goetzmann, 17, of Skeanatles, NY, won the $15,000 High Junior/Amateur-Owner Jumper Classic, presented by Beval Saddlery, riding her own Prestigious. They bested the eight horses that advanced to the jump-off with a clear round over the short course in 31.172 seconds. 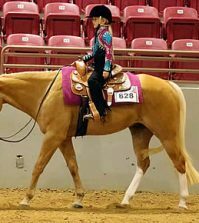 Charlise Casas and Rembrandt Blue, owned by Always Faithful Equine, LLC, were second with a time of 31.537 seconds, and Katie Tyler took third riding her won Shet du Thot in 32.842 seconds. For more information on Old Salem Farm, including its year-long competition schedule, prize lists, clinics, boarding, lessons and training, visit www.oldsalemfarm.net or call 914-669-5610.